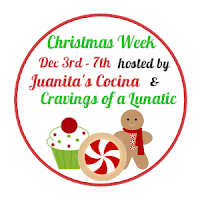 Welcome to Christmas Week, a multi-blogger event co-hosted by Kim of Cravings of a Lunatic and Jen of Juanita’s Cocina. Each day we will be celebrating a new holiday baking theme where each blogger makes a dish they love. We hope you enjoy this fabulous event. Tune in each day starting Monday December 3nd and ending Friday December 7th. I found a package of macadamia nuts all nicely chopped up for me. If you prefer larger pieces, feel free to chop your own. Preheat oven to 375 degrees F; line cookie sheets with parchment paper. Using a stand mixer with the paddle attachment*, cream the butter and the sugar until light and fluffy, about 2 minutes. Add the eggs, one at a time, beating well after each addition. Stir in the vanilla and the almond extracts. Add the flour, half at a time, to the creamed mixture, stirring just until well-incorporated. The dough will be stiff. Stir in the nuts and the white chocolate, then gently stir in the cherries. Since my jar of cherries was larger than I needed, I measured out one cup. Drop the cookie dough by rounded tablespoons on to the lined cookie sheets. Bake for 8-10 minutes, until they are firmly set, but not browned. Remove from the oven and allow the cookies to cool completely, before removing from the sheets (if you need to reuse the pan, simply slide off the parchment paper with the cookies, and reline). *Using a stand mixer is recommended, as the cookie dough is rather stiff. There you have it---beautiful cherry cookies! While you can certainly make these year-round (wouldn't that cherry-red color be great for Valentine's day? ), I hear that this particular recipe is Santa's favorite. Please leave a few out for the jolly old guy. These are gorgeous cookies, Cathy! And full of all my favorite cookie add ins...yum, yum!!! So fun baking along with you for #ChristmasWeek! Okay these are seriously calling my name. I am such a cherry fan so these have to be made. Thanks so much for joining us Cathy. I look forward to more deliciousness all week. And thanks for posting for 5 days in a row. I know it's such a huge commitment. I love seeing cookies with the bright red of maraschino cherries in them. What a perfect cookie for Christmas or Valentine's or any day! Yum! I love the bright cherries with the white chocolate. Perfect for the season! I love the bright red of the maraschino cherries...and the combo of them w/ the white choc and macadamia nuts. I'm probably gonna have to try these! You win the award for the purtiest cookie of the day. Gorgeous colors with those cherries! Happy day #1 Cathy! Wow, the combo of maraschino cherries, white chocolate, and macadamia nuts just sounds like a party waiting to happen in my mouth!